⪧ Christopher R. Mitchell, Ph.D. I am Christopher Mitchell, CEO and co-founder of Geopipe, and an adjunct professor of Computer Science at NYU's Courant Institute of Mathematical Sciences. 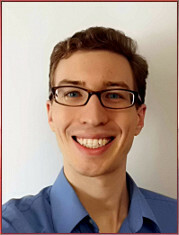 I previously was a postdoctoral research fellow and graduate student in the Networking and Wide-Area Systems group at the Courant Institute of Mathematical Science at NYU. I defended my PhD thesis in Computer Science, focusing on Distributed Systems, in August 2015: "Building Fast, CPU-Efficient Distributed Systems on Ultra-Low Latency, RDMA-Capable Networks". I earned my Master's degree in Electrical Engineering in May 2010 and my BE in EE in May 2009 from the Cooper Union in New York City. My current research focus is on applications of distributed systems, deep learning, and computer vision approaches to automated reality modeling. Highlights of my graduate work included the Cell and Pilaf projects exploring RDMA-based distributed systems, as well as Oolong. My Master of Electrical Engineering thesis focused on the refinement and applications of realtime computer vision algorithms to wearable computing for augmented reality. I have previously explored the parallelization of encryption and stochastic algorithms on FPGAs and GPGPU hardware. My personal research centers on the implementation of high-functioning hardware and software applications for low-resource portable devices. I am the administrator emeritus of Cooper Union's EE μLab and ICELab, a graduate fellow emeritus of the S*ProCom² lab at the Cooper Union, and was a Continuing Education instructor for Cooper Union's Immigrant Retraining Program. I maintain my 14,000-member technology-focused website and forum, Cemetech, where I publish most of my personal projects and teach programming. I recently published a book teaching programming skills and a second book teaching graphing calculator skills for math. In these pages you can find information about me, my publications, my past, present, and future projects, and view my résumé. If you have questions, do not hesitate to contact me at the email address at right. Cell - Distributed in-memory transactional store leveraging HPC networking features and offering database-like features. Pilaf - A high-performance distributed in-memory key-value store leveraging HPC networking features. Oolong - A generalized high-performance distributed computing framework for asynchronous applications. Scouter - My completed Master's thesis, focusing on the application of Convolutional Neural Networks (CNNs) to facial detection and recognition in wearable computing systems. WiSO Safe - Senior Engineering Design project to prototype a wireless sensor network to detect rip currents at beaches. Using the TI-83 Plus/TI-84 Plus - A book teaching calculator skills for math on the TI-83 Plus/TI-84 Plus graphing calculators. Published September 2013 by Manning Publishing. Programming the TI-83 Plus/TI-84 Plus - A book teaching beginner programming skills by way of the TI-83 Plus/TI-84 Plus graphing calculators. Published September 2012 by Manning Publishing. MiNT - A research project to create a physical, small-scale wireless network for simulating network scenarios using commercial robots and embedded hardware. Uses a modified version of NS2 to run software simulations in a physical environment to increase simulation accuracy. Cellular Density Project - Using image processing to detect cancerous cells in photomicrography. jsTIfied - An online TI-83+/TI-84+ emulator written entirely in HTML5/JS. globalCALCnet 2.0 - Software, firmware, and hardware project to connect inexpensive commodity devices over the internet. CALCnet2.2 - A robust networking protocol for two-wire devices like TI calculators. Covers bottom 4 layers of OSI model. Clove 2 - A prototype Bluetooth typing glove for wearable computing applications. Doors CS 7.2 - A modern GUI and shell for z80-based TI graphing calculators. Includes a cursor-based interface, module and library support, associated programs, networking, and more. SimmsAI - A distributed, parallel neural network for experimentation with natural-language learning and communication. smsdoor - An automation project undertaken with a classmate to provide an IM-, SMS-, and web-based interface to control access to a systems room at Cooper Union. Invalid Tangram DE - A calculator port of a popular puzzle-2d shooter cross for PCs, Invalid Tangram combines a tetris-like system of powerups with a classic Space Invaders-style space shooter. mobileTunes 3 - The third version of my z80 assembly music player, mobileTunes 3 can play quadrophonic, stereo, and mono MOD music using a TI graphing calculator's serial link port. Includes a full GUI. SourceCoder 3 - A full web application to facilitate editing of TI-BASIC programs, SourceCoder 3 can import and export calculator-formatted files, display and edit them, and even store projects for collaboration and later editing. Ultimate Calculator 1/2/3 - Featured on Digg and Hackaday; a modified calculator with a full-color backlit screen, built-in PS/2 port for keyboard and mouse connectivity, case mods including a paint scheme and case windows. UC3 explores mobile device design, fabrication, and prototyping issues. WorldTrends 1/2 - A web app to gather activity and headline data from popular global and tech news sites. Currently aggregates and charts news trends, but will eventually be used to experiment with predictive algorithms.